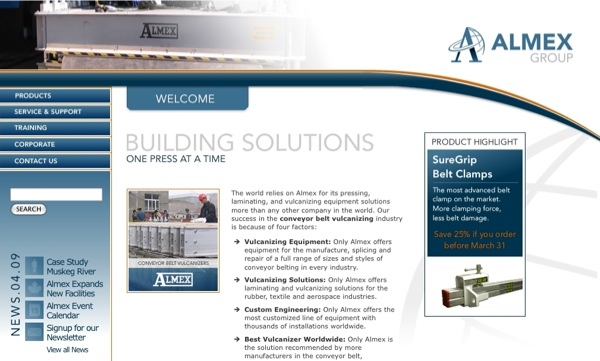 The Almex Group is an international leader in the conveyor belt industry. After completing a small product launch site with a very tight deadline, Almex entrusted us with the redesign of their corporate website. Part of a larger rebranding, we worked with Icon Digital Design throughout the project to ensure that the website matched the new brand they were establishing. This project included a content management system that will allow Almex to update the site in-house, a full product catalogue, and an email marketing system used to send newsletters, product announcements and other promotional campaigns to their clients. We also worked closely with Southeast Web Media to implement advanced search engine optimization.